The Brandeis University campus comprises roughly 100 individual buildings. Blueprints and architectural drawings of these buildings must be retained for as long as each building exists. A single building can have dozens or more associated drawings, as the drawings typically describe specific sections or systems within a building. These documents serve as essential references whenever construction work is being planned. Knowing the location of a gas or electrical line, what topography lies beneath a building’s foundation, or otherwise how something was built is a necessary preparation for new renovations or routine maintenance. Facilities Services use the drawings in their work, ensuring the integrity of Brandeis’s physical plant. New projects entail new documentation of the work that is done, which contributes to the constant growth of Brandeis’s collection of drawings. Several years ago, Facilities Services oversaw a scanning project that digitized Brandeis’s architectural drawings, significantly improving their accessibility. Unfortunately, the scanning vendor returned the original documents in a disorganized state. Since it is necessary to retain the drawings, it was necessary to identify which buildings they were so that they could be reboxed and stored permanently off-site. 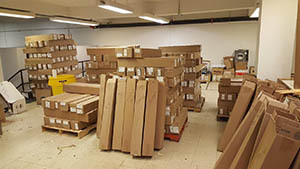 University Records Management (URM) worked with Facilities to identify, rebox, and barcode the new boxes. Many of the approximately 300 legacy boxes returned by the vendor were inaccurately labeled or contained drawings from more than one building. Other drawings documented buildings which have been demolished or sold by Brandeis. Over the course of nearly 18 months, URM and Facilities collaborated in reorganizing the drawings. By the end of the project, the drawings had been separated into more than 500 boxes. 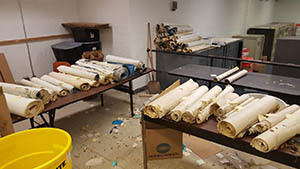 Many duplicates, demolished, or otherwise defunct drawings were retained for appraisal of their historical or research value by the University Archivist. After the drawings had been identified and reboxed, URM sent them to off-site storage. Off-site storage is one of the core URM services. Contact URM for your Brandeis records needs at records@brandeis.edu.